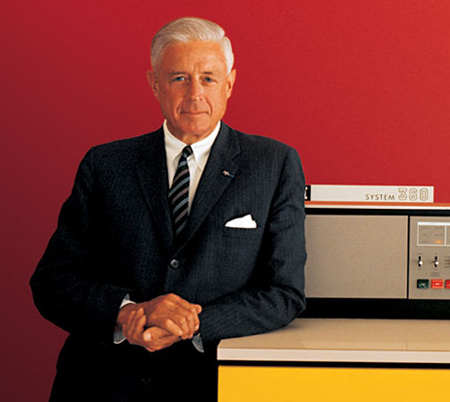 Jim Collins, author of Good to Great, ranks the IBM System/360 as one of the all-time top three business accomplishments (along with Ford’s Model T and Boeing’s first jetliner, the 707). It allowed IBM to dominate the computer industry for the next 20 years. 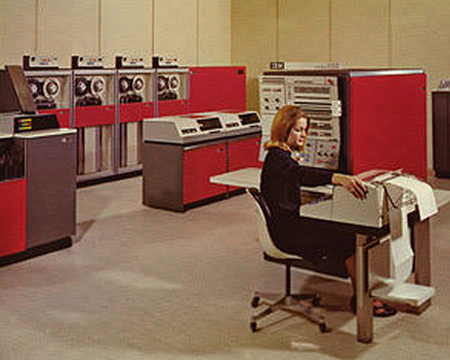 Pictured to the left is a mid-sized IBM/360 Model 40. The word “system” was chosen to signify that the offering was not just a group of processors with peripheral equipment but rather an aggregation of interchangeable hardware units with program compatibility from top to bottom. The number “360” (the number of degrees in a circle) was chosen to represent the ability of each computer to handle all types of applications. 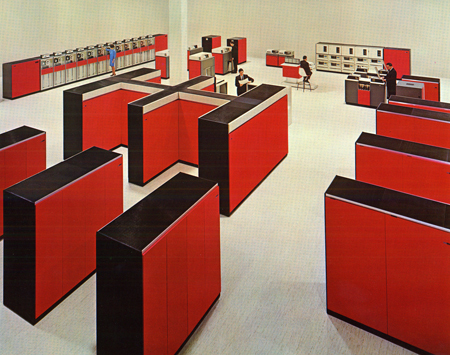 In April of 1964, the announcement of the IBM System/360 was revolutionary in computing at that time. It replaced all five of IBM’s previous (6-bit-byte) computer product lines with a family of six new processors. Over a 1,000 systems were sold in the first month! The System/360 products were truly general-purpose machines offering new supervisory features, powerful logic operations, and a wide variety of data formats. Hardware-wise the System/360 used new integrated circuit technology and a new 8-bit-byte architecture. The six processor models offered a performance range of 50 from the bottom to the top of the line. There were 54 different new peripheral devices all announced at the same time! The peripheral devices had a "standard interface" providing full interchangeability between all the different models, i.e. upgraded processors could be added down the line with no changes to the rest of the system. Also, more compatible tape drives and disk drives could be added at any time to a system. The unified software package included network communications capabilities, 16 different language compilers, and a disk-based operating system. (instead of a tape-drive system). 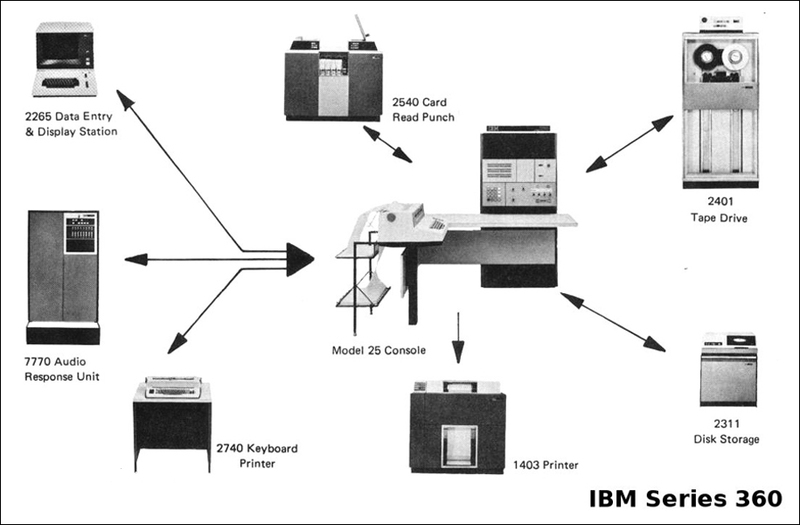 Before and after World War II, IBM was the dominant supplier of electronic calculating machines for punched-card type systems. In 1956 IBM passed Remington Rand as the primary supplier of large electronic programmed computers. Also in 1956, Tom Watson Jr. (pictured to the left) replaced his father, Tom Watson Sr. as CEO of IBM. In 1959 IBM introduced the 1401 computer which was solid state (no vacuum tubes). Another main feature was that punched card storage was replaced by magntic tape. The 1401 sold for only $2,500 a month rent and became extremely popular. Over 4,000 machines were sold in the first month! Small companies could now afford advanced computers. The 1401 soon became the best selling computer in the world at the time. During this same period the IBM 7000 Series was very sucessful in the large systems market - universities, governments, large research labs, etc. The 7000 Series sold for over $10,000 a month. In 1959 Tom Watson began to focus on future problems, not past successes. Rapid changes in technology and market requirements had over-extended the capabilities of the company’s Data Processing Division. Major changes were in order. Tom Watson’s solution was to remove from that division all product development responsibilities. The revised Data Processing Division would be responsible only for maketing, sales and service. The responsibility for product planning, development and manufacturing was given to two new divisions. The Data Systems Division, with plants and laboratories in Poughkeepsie, NY would concentrate on large computer systems, typically renting for more than $10,000 per month. The General Systems Division, with plants and laboratories primarily in Endicott, NY and San Jose, CA, would concentrate on smaller systems. Both divisions would report to T. Vincent Learson, an imposing man of 6 feet 6, who had a well-deserved reputation for being insightful, aggressive, and decisive. He was the only executive Tom Watson thought was smart enough and tough enough to manage all the computer systems businesses. The announcement was unprecedented in scope. Six processor models, designated the 30, 40, 50, 60, 62, and 70, were initially announced. Models 60, 62, and 70 were replaced by superior 65 and 75 models before any of the original three were shipped. Each processor was suitable for either business or scientific applications. 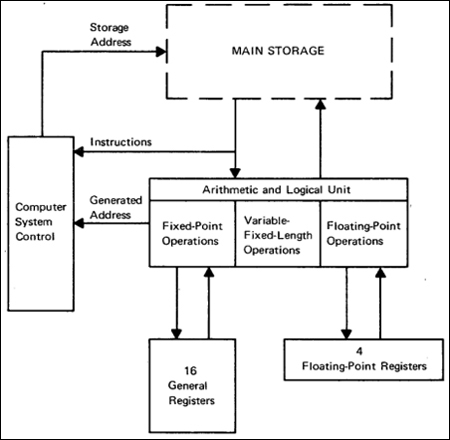 Floating-point instructions (not needed for business applications) were offered either as standard equipment for certain models or as a "field-installed option" for others. The central processor of each computer was capable of executing machine-language programs for all the 360 processors with the "same or smaller I/O and memory configurations". Solid Logic Technology (SLT - no vacuum tubes, only transistors) developed by IBM’s "new" Components Division was used in all the processors. Memory had 24 bit addressing, standard 32 bit words with access to 16 bit half words. There were 16 general purpose 32 bit registers and four 64 bit floating point registers. The 360 had a 64 bit program status word (PSW) that contained: the address of the current instruction being executed, condition codes, and interrupt masks. All input-output equipment such as tape and disk storage, card readers, printers, and terminals each had a "standard interface" so they would be "field" interchangeable. A very important innovation was the use of a small, very high-speed memory with permanently stored code, called the control store. This feature was soon copied by almost every competitor and became known as "microcode memory". Initially known as a “read-only control store,” the control store eliminated the need to hard wire into each processor the capability to perform each of the program instructions required of "all the processors" that were compatible. The vision for a "completely new improved" product line was saved by the introduction of the control store. In operation, each program instruction (such as add, multiply, or branch) was equated to an address in the control store. When the word at this address was read, its permanently stored code was used to execute the instruction. If an instruction execution required a sequence of like instructions, (i.e. more than one machine cycle), the first word addressed carried the address of the next control-store word needed to complete the instruction execution. By the time System/360 was announced, ferrite-core memory technology had become standard. Core memories were first developed by the MIT Lincoln Laboratory, and were manufactured by IBM for the United States SAGE air defense system in 1956. Magnetic-core memory was the predominant form of random-access computer memory for 20 years between 1955 and 1975. 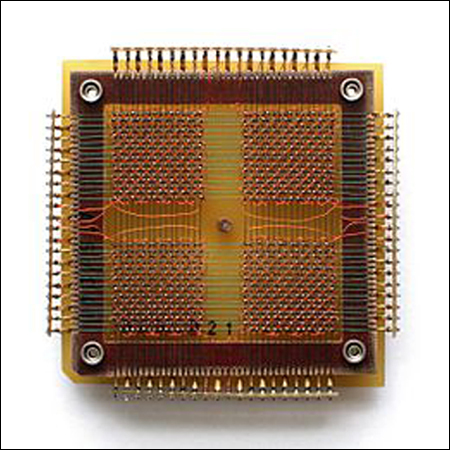 Core memory uses tiny magnetic toroids (rings) through which wires are threaded to write and read information. Three wires pass through each core. Each core stores one bit of information. A core's magnetization can be clockwise or counter-clockwise. The value of the bit stored in a core is either zero or one according to the direction of that core's magnetization. The magnetizations of the cores are changed by sending pulses of electric current through selected wires. The process of reading the core causes the core to be reset to a zero, thus erasing it. When not being read or written, the cores maintain the last value they had, even if the power is turned off. This is called non-volatile memory . IBM’s experience in the SAGE project gave it an advantage, and so did its experience in designing and manufacturing ferrite-core memories for commercial products. For System/360 memories, IBM engineers made more improvements, using smaller cores and superior drive and sense circuitry. Memory capacity on the small Model 30 ranged from 8K to 64K bytes and on the Model 75, it ranged from 256K to 1024K bytes. The Model 65 memory was about 150 times faster than Model 30 memory. IBM had invented a method for using lightweight mylar tape coated with magnetic material for information storage on its IBM 701 computer in 1952. Tape breakage was the key problem solved by IBM engineers by allowing for large loops of tape in the vacuum columns placed on either side of the read-write head. This provided sufficient slack to avoid breakage even in rapid start-stop operations. The only significant changes made for use on the 2401 Tape Drive was the addition of read backward capability with an improved head that could read and write nine tracks on half-inch tape to accommodate the 8-bit byte plus an extra error code bit (9 bits in total, one on each track). Following delivery of the first magnetic disk storage device on RAMAC in 1956, IBM rapidly improved the performance and cost of disk storage for use on subsequent systems. When the IBM System/360 was announced in 1964, the worldwide inventory of installed computers was estimated to be about $10 billion of wich IBM had about $7 billion. Five years later IBM’s worldwide inventory had increased more than three fold to approximately $24 billion (73%) and the rest of the suppiers had about $9 billion (27%). The popularity of the System/360 made it difficult for others to compete across the broad spectrum of the general purpose computer market. Only five companies remained after 1971. They were dubbed the BUNCH: Burroughs, the Univac Division of Sperry Rand, NCR, Control Data, and Honeywell. The BUNCH companies each specialized in narrow areas of the market. The most significant market impact of the System/360 resulted from its "standard peripheral interface". This made it easy for others to attach their products to System/360 processors. An entire industry was soon created of companies making and supplying plug-compatible peripheral products. 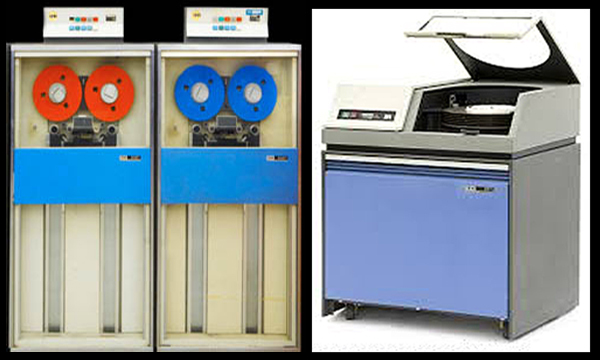 Led by Telex with tape drives in 1967 and Memorex with disk storage units in 1968, the non-IBM peripheral products industry enjoyed dramatic growth. As the 1960s came to an end, the System/360 needed to be upgraded with integrated circuits and many other hardware and software improvements. The upgraded system was announced in June 1970 as System/370 to signify that it was a system for the 1970s. Its designers had hoped to achieve a dramatic leap forward, but they settled for incremental improvements. Among these was the addition of 6 new instructions to the original instruction set in order to speed up processing of certain tasks. Any program that used the new instructions would not run on an older System/360 computer. However, all programs written for the older systems would run on the newer systems. Note: The author worked for IBM in Endicott, NY from 1960 to 1963. He then worked for Control Data Corporation for 18 years.